1. Dining pavilion in Melbourne. 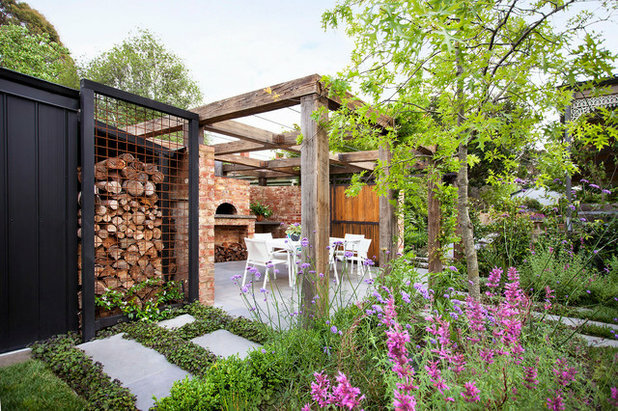 A stroll across the garden brings guests to a three-sided entertaining area in this Australian backyard. Wisteria vines twine up the posts of the shade structure, and the table is placed to receive homemade pizzas hot out of the wood-fired oven. 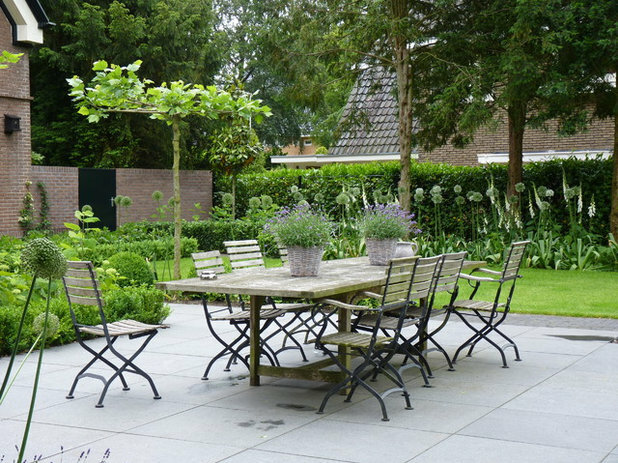 In some cases, positioning an outdoor dining area away from the house can make sense — and can be worth a trip carrying a tray from the kitchen — as it creates an inviting focal point across the yard and a potentially memorable journey through the garden to get there. You’re set if you have an outdoor kitchen or a pizza oven, but you could easily bring over a portable grill to cut down on trips to the kitchen. 2. Farm to table in Santa Barbara. 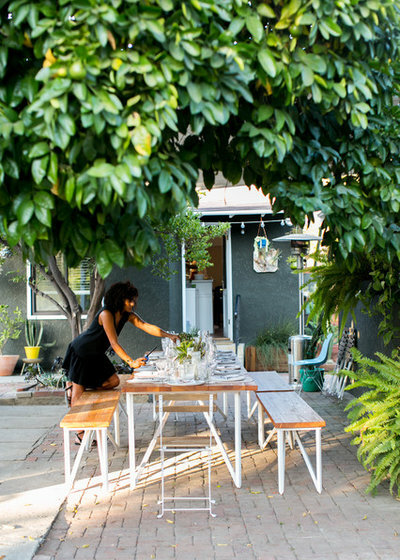 This Central California backyard has the best of both worlds: a private bistro table for two set amongst the veggies and, on a patio closer to the kitchen, a dining table that seats six. 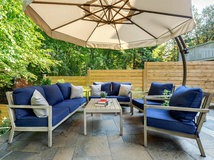 The two seating options make the backyard more versatile, depending on group size and time of day someone might like to enjoy either space. Either way, harvesting fresh herbs for garnishes is a cinch. 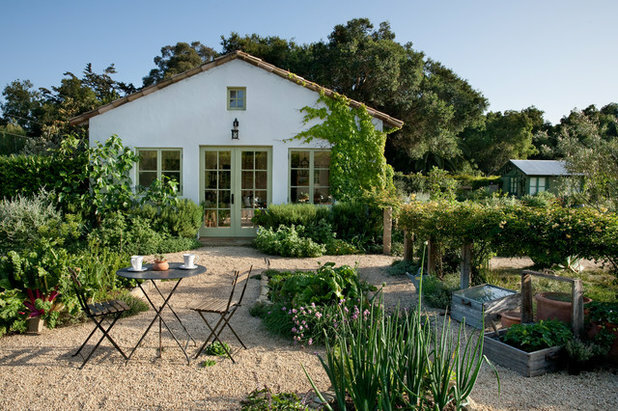 You can appreciate fresh ingredients when you’re dining right next to where veggies, herbs and berries grow. 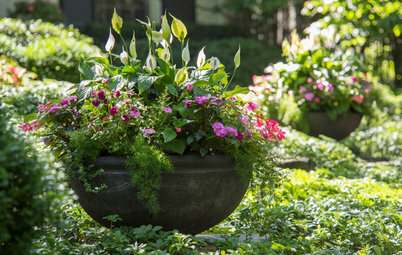 If you have a smaller outdoor place, pot up container-friendly veggies and herbs in large terra-cotta pots and place them in a sunny spot near your outdoor dining table. 3. 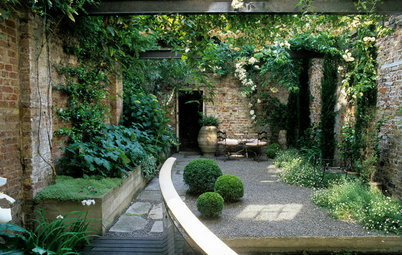 Romantic courtyard in Scotland. 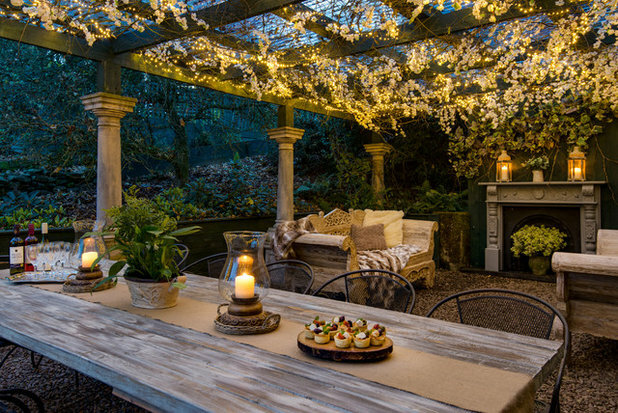 Fairy lights woven through fabric flowers create a magical atmosphere for this gravel courtyard in the Scottish Borders area, south of Edinburgh. 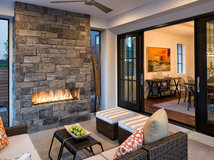 In chilly summer climates, the addition of outdoor lights, sources of warmth and a rain cover, if needed, can extend how late into the evening you can use the outdoor rooms. 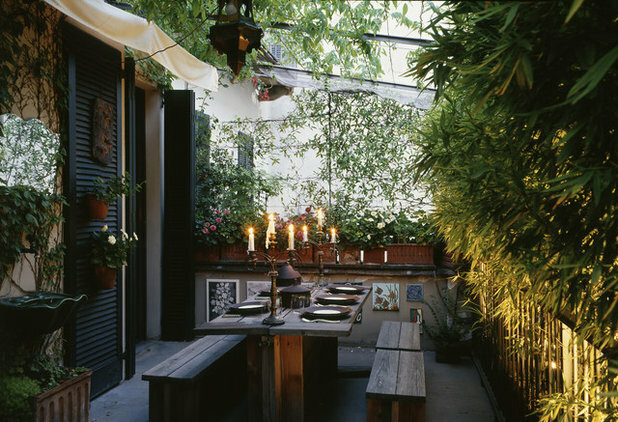 For this twinkling gravel courtyard, the designer styled the dining and seating arrangement as one might for a room indoors. Finishing touches, including flickering candles, a linen table runner and soft throws for draping over laps or around shoulders, contribute to making the courtyard feel just as cozy, and even more magical, than a room inside. 4. Laid-back in Los Angeles. 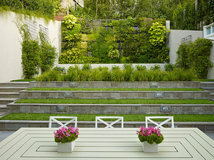 An outdoor dining setup of two tables and lines of bench seats in clean white metal and blond wood sets a fresh, casual theme in this Los Angeles backyard. 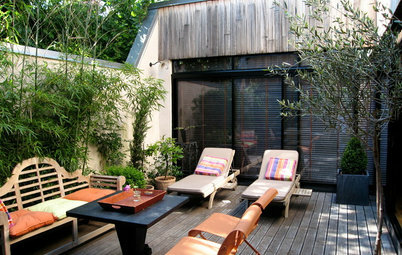 The patio is covered by an awning that keeps the dining area cool and shaded throughout the day. 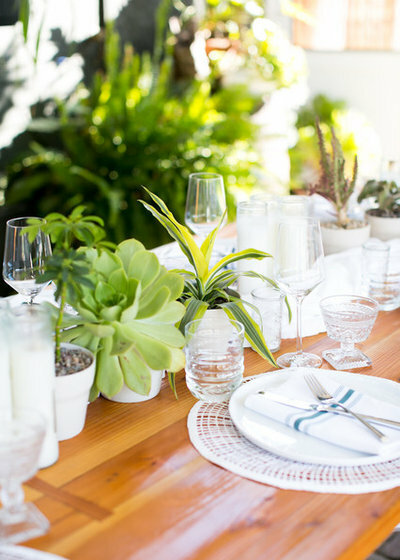 Decorating the table with white, glass and green elements — including potted aeonium, dracaena and other foliage plants — elevates the design from casual picnic to elegant summer party. 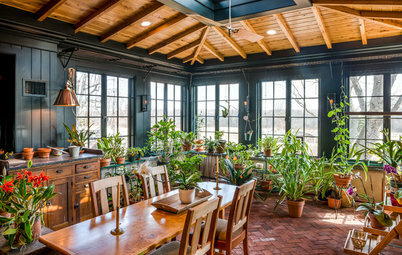 If you’d like to re-create this look, consider having tabletop-size potted plants on hand to use as centerpieces for all of your backyard occasions this season. 5. Cozy cubby in San Francisco. 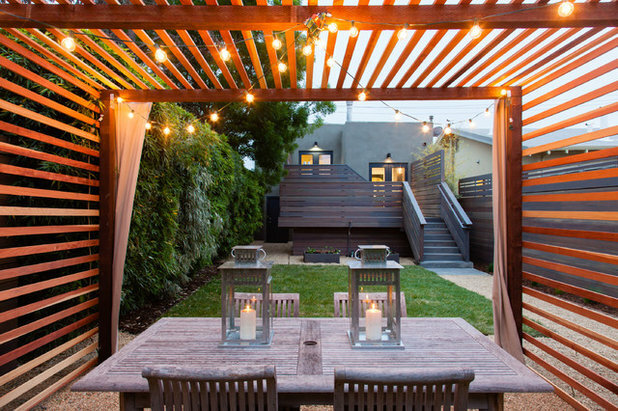 There’s something that feels snug and inviting about this redwood slat pergola hung with strings of cafe lights, set across the yard from the main house. 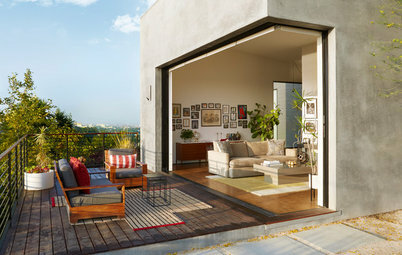 It’s almost like a fort for grown-ups, made that much more sophisticated by the modern simplicity of the pergola’s design and softening curtains hung from the entry. 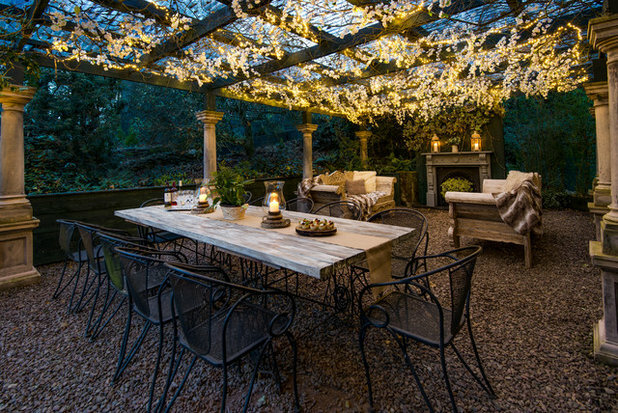 To replicate the feeling of this cozy space, create a ceiling to cover your outdoor dining setup and add an inviting glow with string lights. 6. Alfresco and upcycled in Ohio. 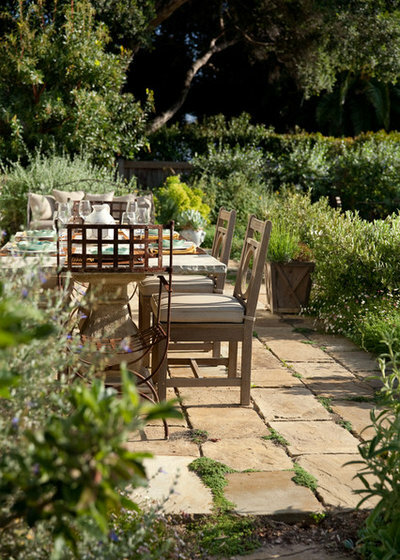 Simply positioning a dining table in the most inviting place in your backyard — such as right next to spring beds in bloom or under a shade tree’s canopy in summer — can be a fun strategy for mixing up your outdoor dining routine. To keep things casual and spontaneous, don’t worry about matching chairs, cutlery or plates; just bring out what’s easy to use and cut a few seasonal flowers for the table. 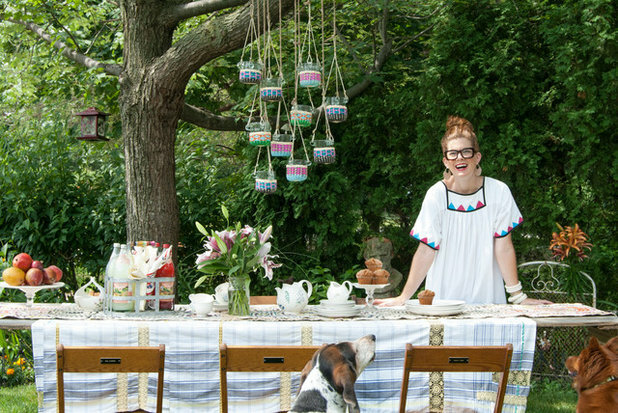 The owners of this Euclid, Ohio, home set up this charming outdoor dining table almost entirely with thrift store and dumpster finds. The 12-foot-long table was recycled from old barn siding, and the owner rescued the wooden folding chairs from a dumpster. 7. Green and serene in the Netherlands. 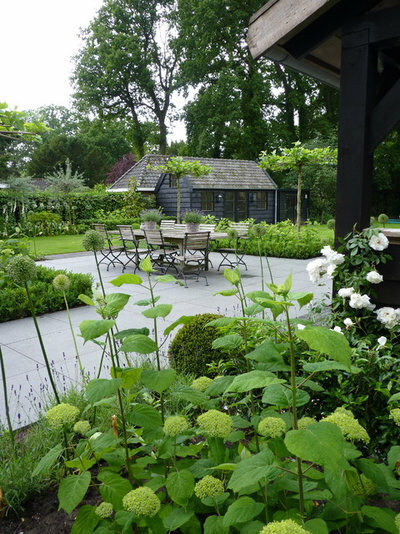 In this verdant Dutch backyard in Bussum, southeast of Amsterdam, a patio bordered by lush planting beds packed to the brim with alliums, foxgloves, climbing roses and viburnums, creates a romantic setting for an outdoor meal. 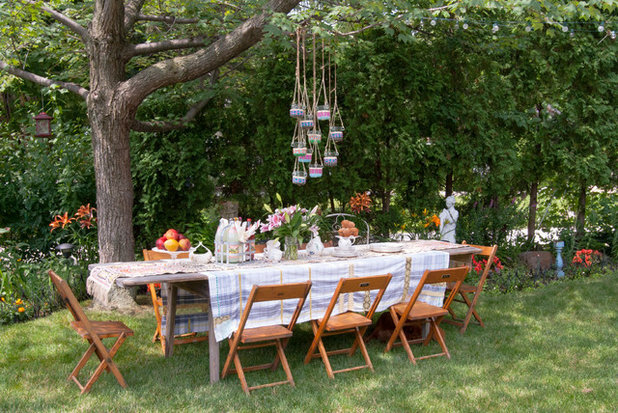 If the garden itself is the focus, as is the case here, keep the table setup simple and understated. The designer chose a classic wood-and-metal dining table large enough to seat eight and coordinating cafe chairs. Pots of lavender act as long-lived, sweet-smelling centerpieces. 8. Party-ready in Austin. 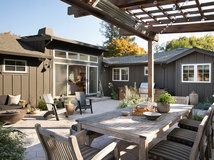 Designed for hosting outside, this Texas backyard has a flexible setup, including a grill, fire pit and wood dining set, all of which can be easily moved to suit the needs of the family or event. 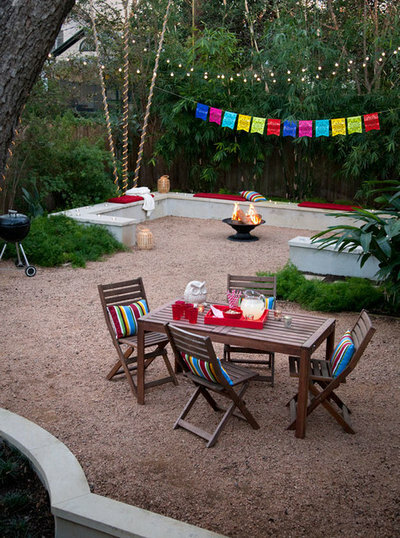 Here, the backyard has been done up for a summer party, complete with bright, festive decorations, including a colorful string of papel picado (cut paper), cafe lights, bamboo lanterns and striped throw pillows. 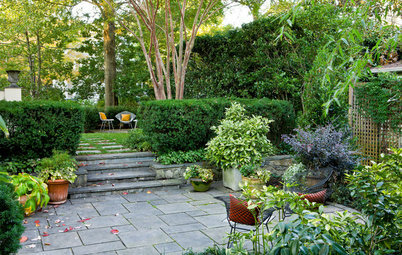 None of the decorations is expensive, but in combination all go a long way toward making this backyard feel like a fun, party-ready space. 9. Candlelit in Milan. 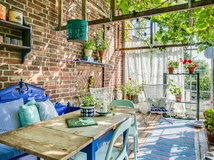 This inviting terrace outside a home in Milan shows that you don’t need much space or fussy furniture to create an outdoor dining space with plenty of ambiance. A simple wooden picnic table and bench seats feel understated yet elegant set with candelabras and dark plates. To re-create this look, skip the paper plates and bring out candles and nice plates and cutlery from the house, making eating alfresco feel like an occasion. 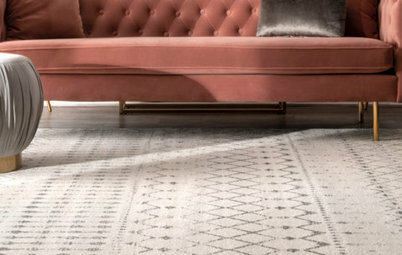 Going with all dark tones creates a particularly rich look. 10. 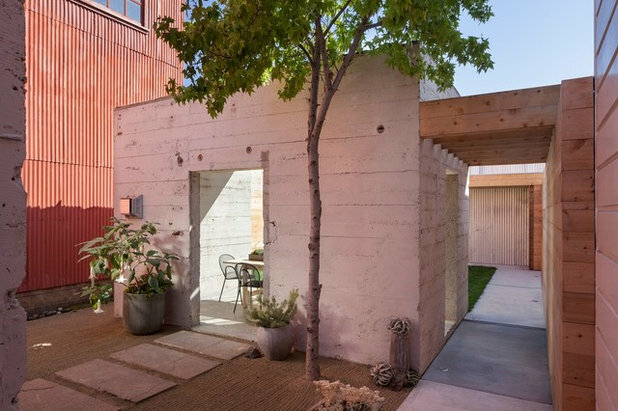 Urban nook in San Francisco. When a young family bought a formerly industrial space in the heart of San Francisco’s Mission District, one of their top priorities was to create an outdoor space for eating and allowing the kids to run around. 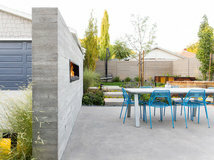 The architect of the project took an existing concrete structure on the lot, cut it in half to open up one side and created a modern outdoor dining nook. 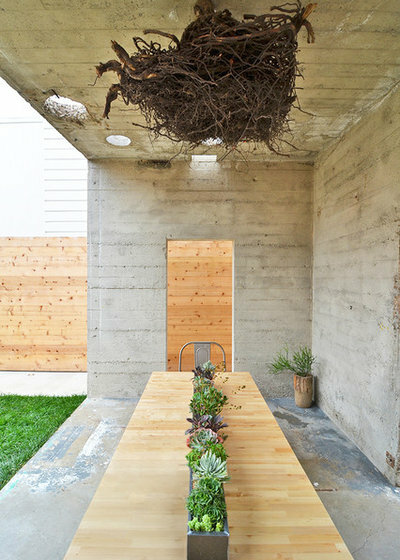 Organic elements like a light wood table, a living succulent centerpiece, a soft green lawn for the kids and a hanging root ball of a maple tree dug up on-site (the plan is eventually to turn this into a light fixture) all help soften the harsh, industrial feel of the raw concrete and make the urban dining space feel more livable. Very nice Stephanie - I really like the yellow and cobalt blue together. Great table! 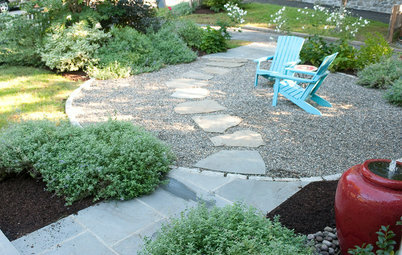 Stephanie, I like your backyard setting a lot !!! 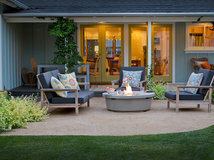 would love to know where you get the yellow chairs and the fire pit. 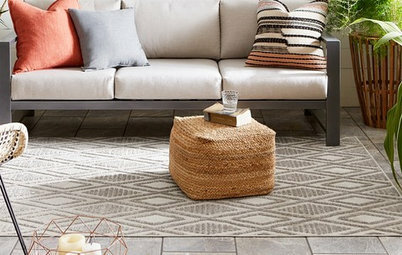 Chairs are from Ikea and fire bowl is from pottedstore.com in LA but delivers anywhere.